ChampCash Review – Is this Legit or Scam? Can You Earn 1 Million from it? I have been learning about ChampCash for three months now. I liked the program and the concept of ChampCash but there are many issues with it. In this article we tried to give you an honest review of ChampCash. What ChampCash is, how does it work, how much money can you make from it etc.. Is it really for you or just another scam? ChampCash can’t be defined in just one line. You have to read full article to get a complete picture of it. 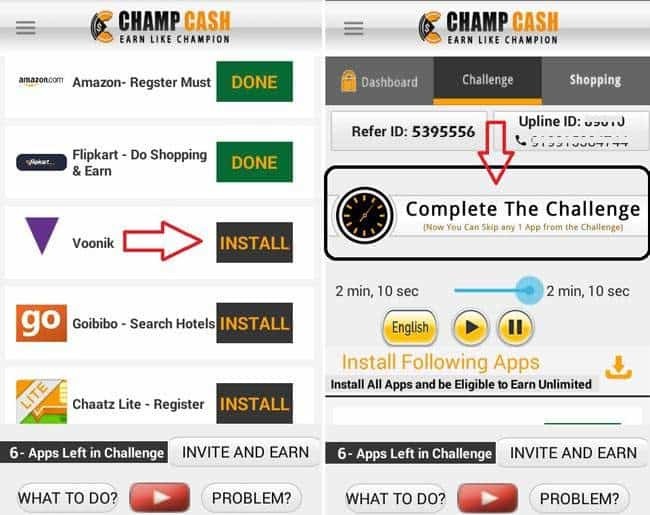 ChampCash is a Free Online MLM program (an Android App) where you earn money by completing tasks, installing apps and most importantly joining referrals under your account ID. ChampCash is basically a network marketing concept and most of your earning will depend upon how many people you are getting to join in this program. The entire network is divided into 7 tiers and you earn according to the commission given in each tier. ChampCash is available in the form of app that can be downloaded from Google App Store and installed on your Android phone. ChampCash is an Indian based company named Champion Networks Pvt. Ltd. It has been there for a year now and getting some traction recently. Let us see it in more details. How do you Sign Up and Get Started? The best thing about ChampCash is it is free to download and install in your Android App. You sign up in just 2 to 3 simple steps. Step 1: Download ChampCash App here and install it and open the application on your Smartphone. Step 2: Sign up with ChampCash and Login. It is very simple process because you have to fill 5 things like your name, email ID, password, DOB and phone no. for Sign up. Click Proceed. Step 3: Finally you have to enter the Refer ID of the sponsor and click the submit button. You can enter this 5395556 as refer ID. Once the signup is complete, you need to accept the challenges in order to start making money. 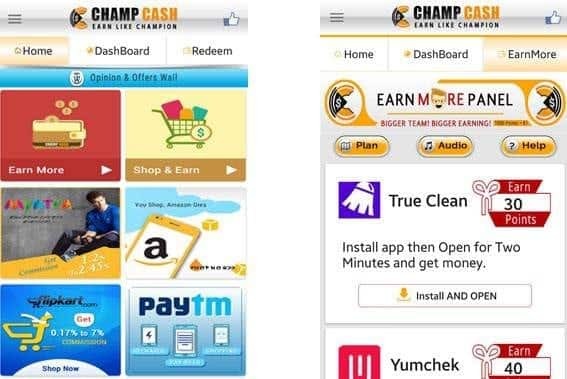 How Does ChampCash Program Work & How to Earn Money? Now we shall look in great details how does it work? There are number of ways to make money from ChampCash. Once you are done with Step 3 of previous paragraph you start taking challenges. There will be an install button in front of every application that has to be downloaded and installed. After installing the application you also have to open it and stay there for at least 10 seconds to 30 seconds. If you want you can register with the app otherwise there is no need to register with any app to complete challenge. Once you install around 8 to 10 apps, you will find done button in front of each app you install. You will receive minimum $1 after installing these apps. If you don’t like the apps, you can remove the apps after 10 days. So basically you install apps and use it for few seconds and get paid. Similar to the above challenges, you can find hundreds of apps on daily basis that you can install and make money. You can see how many points you will get by downloading and installing a particular app. You can check these daily tasks by going to Home>>”Earn Money” icon in your ChampCash app. You can regularly find number of tasks that you can complete & earn more. If you don’t have sufficient space in your mobile, then you can remove older apps that you have downloaded for ChampCash & install new one. This is another way of making money from ChampCash. If you want to purchase something online from Amazon, Flipkart or other shopping portals then go through your ChampCash app. You can buy any item in the same price but if you buy anything through ChampCash, you will get commission in your ChampCash account. Another way is by recharging your mobile or paying utility bills like electricity, telephone etc. with Paytm by going through ChampCash. This is where the real money is. ChampCash claims you can make even $1 million (Rs.6.5 Crores) by referring people through your refer ID. You can find your refer ID in your ChampCash app account. You can promote this MLM with your friend, relatives or co-workers. When you promote ChampCash either you can promote with URL like https://www.champcash.com/5395556 or by sending your refer ID number like 5395556. You will not earn only from your direct referrals but also from referrals of your referrals up to seven levels deep. So you should motivate your referrals to join more free members under them. Within next few weeks, your earnings will grow exponentially. So these are the 4 ways, you can make money from ChampCash. Continue reading the post to know our review whether ChampCash is legit or scam. Any business has a revenue model. They are here for profit and not for charity. So how ChampCash does makes its profit? Well! That is the mystery. According to the ChampCash they earn from advertisers directly. Advertisers mean companies from which you are downloading and installing apps. Once you install an app, company gives money to ChampCash and ChampCash pays you back. You might be eager to know how much money can you make by downloading and installing these apps. Well according to ChampCash you can make up to $1 million. How? You are paid 10 cents to 25 cents for downloading and installing one app. If you download and install all the 10 apps then you may make $1 to $3 in a day. However this is not the way to make $1 million dollar. As I said earlier ChampCash is a MLM program and you make most of the money by inviting your friends and other people to join. ChampCash has 7 tier system where the money is paid according to 7 different levels. Here is table for money distribution. So this is how you make $1 Million with ChampCash. Is it realistic? Well! We will debate this in the last section. Live rate is nothing but sum of all the offers that ChampCash has to distribute in 7 different levels. The rate for completing a task changes depending upon the number of offers live in the ChampCash challenge. Suppose if an offer get paused then live rate may decrease and if new offer comes in then the rate goes up. So a rate for task can be $1 or it can increase to $1.5 depending upon the scenario. As far as money withdrawal (like $10 to $20) is concerned then you can do it in three different ways. So this was all about ChampCash. Now it is time for an honest review of this program. The first question you might ask is it Legit or a Fraud? ChampCash lacks honesty. The first problem is the mystery of Sponsor ID. ChampCash says that their program is free to join and you don’t need any investment. If you don’t need any investment then what is Sponsor ID. You can’t get started without submitting the Sponsor ID. Many people believe in order to get a Sponsor ID you need to pay an amount and then get started. ChampCash has no where mentioned how to get a Sponsor ID and this makes the program dubious. Although you can get the ID online and get started but the ID will be of someone else’s and he will make money using ChampCash 7 Tier System. Without an ID you can only make $10 a day and not $1 million as shown in the table. Secondly the real money that you are going to make is through MLM. Your income would totally depend upon how many people you get as shown in the table. This is a fact that MLM is not an easy thing and how a newbie like you is going to get new members. He or she has no idea of multi level marketing. Moreover ChampCash gives you no support or tutorials for getting new members. Everything is left to you. If you have a prior experience in marketing then you can get new members otherwise you don’t make more than $200 to $300 a month (Just by downloading and installing 10 apps daily). Thirdly the task of downloading and installing apps can be a nightmare. You have to install 10 or more different apps daily and it can eat a lot of your phone’s battery. Moreover, you also need to keep the apps installed for at least 10 days and only after then you can uninstall these apps. Installing 10 apps daily can really slow down your phone. There are other issues while downloading third party apps like what information they are collecting from you. If an app you have just installed has some malicious software then it can be a great security threat. So these were three major issues with ChampCash. There are other following questions that we would like to ask ChampCash. What is retention rate? How many people join and leave the program every month? How much a member earns on an average every week? The maximum amount a user earned through ChampCash? How many have earned $1 million? How much they earn in reference fees? What are the name of advertisers who are willing to pay $2 for installing third party apps? How many advertisers have joined ChampCash? Which are the apps that are referred to users by ChampCash? Is ChampCash registered with regulators like RBI? Does ChampCash is an alternative to 9 to 5 job? What information is obtained by ChampCash while installing various apps on to the phone? Finally, I will conclude by saying don’t expect much from ChampCash. To me it looks like another MLM program which is here for few years and will be gone in coming days just like other MLM programs. 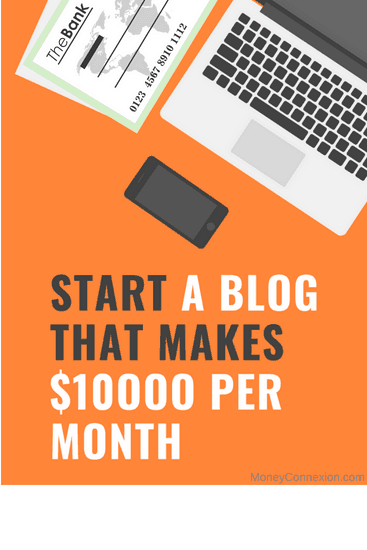 You are not going to make any huge amount of money with it, at best $100 to $200 a month. But as ChampCash is free to join, you may want to give it a try even after reading my review. You can install ChampCash android app from this link & if it ask for refer ID then you can use my refer ID 5395556. If you are already working with ChampCash then share your feedback so that it can help others. wEEKLY PROFIT : RS. 9500 to 12800. DURATION OF WORK : 44 WEEKS. @Nwodom, yes you can do this business from Nigeria. Only avalible to indian users or anyone can join? @ hasnain – Anyone can do..
please give me details about chamcash and does it take money to registor in it? I am already a member of champcash. I haven’t done much but go thru their offerwall and you will find different offers for playing different games on income junction platform. But for that you will have to get your Id upgraded to Pro member. For that they are charging Rs.800/- with an assurance to give you $21.5 as bonus. I didn’t pay the money but somehow my Id got upgraded but till date I have not received the bonus. Thanks for your true review. I too signed up and completed challenges in 2015 and since then I have not opened champcash yet. And, there is no way that any one can earn $1M. It’s all about marketing and earning money.